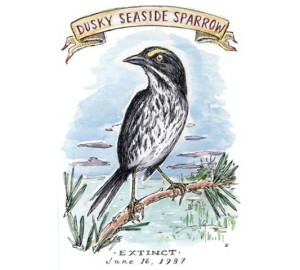 The Dusky seaside sparrow, now extinct, was a non-migratory Seaside sparrow subspecies. Its distinct song and dark coloration was unique among this species (A. maritimus). In 1873, it was first listed as species. In 1973, it was categorized as subspecies. This subspecies was officially declared extinct in December 1990. The mitochondrial DNA of the Dusky seaside sparrow is same as the mtDNA of other Seaside sparrow subspecies. However, it does not show that their classification as subspecies is undeserving. Plumage Primarily gray with white underparts. Yellow hue in front of eyes. Size 12 to 15 cms in length. Wingspan 15 to 20 cms. Weight 20 to 30 grams. Nesting Season March to July. Clutch Size 2 to 5 eggs. Lifespan Around 7 year in the wild. Dusky seaside sparrow inhabited natural salt marches along the upper St. Johns River and Merritt Island in Florida. This subspecies was geologically separated from other Seaside sparrow subspecies. They depended on moist cord-grass for nesting. Conservation efforts appeared to be too late. By 1981, just five male specimens remained. There was an effort to breed the remaining male individuals with Scott’s seaside sparrows so that they can create a hybrid offspring. The Fish and Wildlife Service backed out from their initial support because of Interior’s hybrid policy. Ammodramus maritimus nigrescens was isolated from other subspecies for a very long time given their small inhabited locale. Dusky seaside sparrow and Scott’s seaside sparrow’s mtDNA comparison have been able to determine (to an extent) the last time when these two subspecies came in contact. Presuming that the mitochondrial DNA in sparrows evolves at the same rate like mammals and other birds, the last time when the Dusky seaside sparrow possibly came in contact with Scott’s seaside sparrow was 250000-500000 years ago. 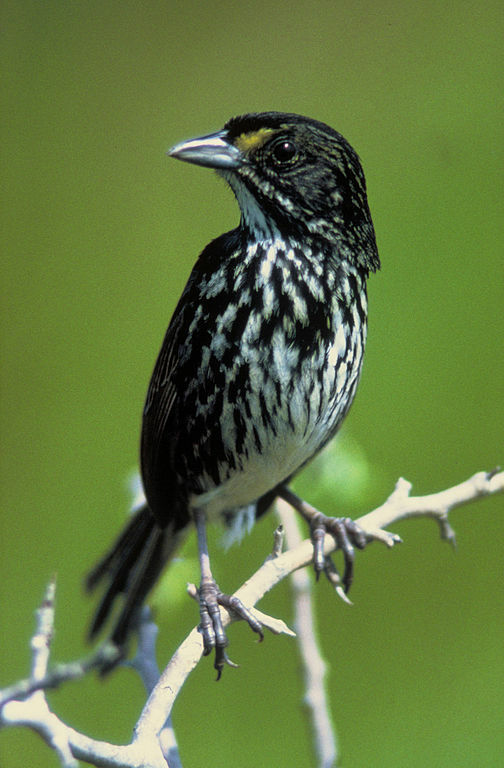 It gave the Dusky seaside sparrow a lot of time to establish its unique characteristics, such as its call and plumage. Habitat destruction followed by pesticides and pollution led to its extinction. Their numbers sharply dropped when their nesting grounds were scourged as the authorities wanted to clear the mosquito population around the Kennedy Space Center. The program flooded the Merritt Island marshes. There was hardly any attempt to get rid of all the harmful effects on wildlife triggered by the flooding. Later, the marshes near the river were drained in order to make a highway to the Kennedy Space Center to Disney World. After Orange Band’s death, its heart and lungs were frozen for possible cloning and other genetic experiments. Dusky sparrow individual Green Band appeared to be elusive. It was never recaptured after it was banded. It was last spotted on 23rd July, 1980. Research done on Fox sparrow (Passerella iliaca) showed that some subspecies of one color group could have the color of another in spite of carrying different mtDNA type. Some researchers believe that if the breeding program of was continued with Ammodramus maritimus nigrescens hybrids, then sparrows carrying the color of Dusky seaside sparrows could be produced. But just after the breeding program was withdrawn, the remaining hybrid specimens either escaped from captivity or died. It also ended the hope of preserving the taxon. Captive breeding of Ammodramus maritimus nigrescens with Scott’s seaside sparrow (A. m. peninsulae) was given permission in 1979. By the year 1980, there were five Dusky seaside sparrows in a breeding facility in Gainesville, Florida. One specimen, called Orange Band (blind in one eye) was unique of them all. Orange Band was left alone by himself on the St. Johns Unit of the St. Johns National Wildlife Refuge after a yellow-banded specimen was caught in 1979. In June 1980, Orange Band was caught eight miles south on the Beeline Unit with a green band specimen. In 1983, the last four living specimen were taken to Walt Disney World Resort to carry on crossbreeding efforts. The individuals stayed in a protected environment on the Discovery Island nature reserve, owned by the resort. By 31st March, 1986, Orange Band, was the only specimen that remained. It reached an extreme old age, probably 9 – 13 years, and died on 17th June, 1987. After the last specimen died, the breeding initiative was called off given the facts that hybrids that existed would not be able to reproduce dusky sparrows as they did not have proper mtDNA possessed by Ammodramus maritimus nigrescens. Published on July 16th 2015 by admin under Birds.